Tempe, AZ…… West Coast Turf, growers of BOBSod-the official turf of the Arizona Diamondbacks and Chase Field--is proud to have recently grassed "D-votion Field" in Estrella, AZ, and Doug Davis Field in Camp Verde, AZ. 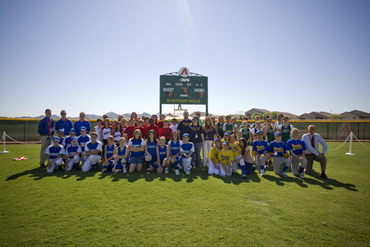 These 2 fields are the newest of 27 total fields in the Arizona Diamondbacks Foundation "Diamonds Back" Youth Field Building Program, which was started in the year 2000. The cost of each new facility is about $300,000 per field, and is supported by the "Diamonds Back" corporate sponsors, local businesses, and a $50,000 monetary donation from the individual Diamondback players. This program has allowed hundreds of children from across the state to play baseball and softball at top quality facilities. The new fields feature lights, fencing, irrigation systems, scoreboards, and West Coast Turf's stadium quality turfgrass sod. "D-Votion Field" was dedicated in the name of D-backs fans by the request of a player whom donated $50,000 and desires to remain anonymous. The tag comes from the "D-votion fan experience" promotion which was launched to recognize the team's most devoted fans. "Since this is a field for the fans, 'D-votion Field' is a perfect fit," said D-backs' President Derrick Hall. In the Verde Valley, Doug Davis Field is a much needed and welcome addition. Davis did not hesitate when asked to donate $50,000 towards the new field. "Arizona is my home. This field here will hopefully help generations of players, and I'm honored to have my name up there on the scoreboard," Davis said. "There's an awful lot of work that goes into this field building program from a lot of different people-and I want to thank them all. It is emblematic of what we are about and it displays who we are," added Diamondbacks' General Partner and CEO Jeff Moorad. "These local kids get the chance to play on a major league caliber field, and that's an important opportunity for them. We look forward to many more." Both fields were sodded by West Coast Turf-the same company that grasses Chase Field for the Diamondbacks, and Major League Baseball fields at Dodger Stadium in Los Angeles, CA; PetCo Park in San Diego, CA; McCafee Coliseum in Oakland, CA; Kauffman Stadium in Kansas City, MO; Angel Stadium in Anaheim, CA; as well as Spring Training facilities for the Padres, D-backs, Mariners, Royals, Rangers, White Sox, Giants, Brewers, Indians, Dodgers, and Angels. West Coast Turf is a full service sod grower and installer with five locations: Palm Desert, CA; Tempe, AZ; Livingston, CA; Winchester, CA; and San Marcos, CA. Sister company and BOBSod grower Western Sod is located in Tempe, AZ. The company offers more than 20 different varieties of turfgrass, as well as installation, seed, and seeding services to both professionals and homeowners. For more information visit www.westcoastturf.com or call 888-893-TURF.